2 How to participate and win the prize? Happy Sunday guys.. Hope your weekend is going on smoothly? Anyway, this is to inform you that Itel Mobile are currently offering a mouthwatering promo which may land you a new smartphone for free. Well, only little task is required in other to get this smartphone for free. Do you remember the newly Itel1516 Plus that was posted HERE some weeks ago which I said that its comes with 5,050mAh battery and also have some cool specs & features that will wow you. Itel is giving out this lovely smartphone for free on a little condition/requirements. So what are the conditions? 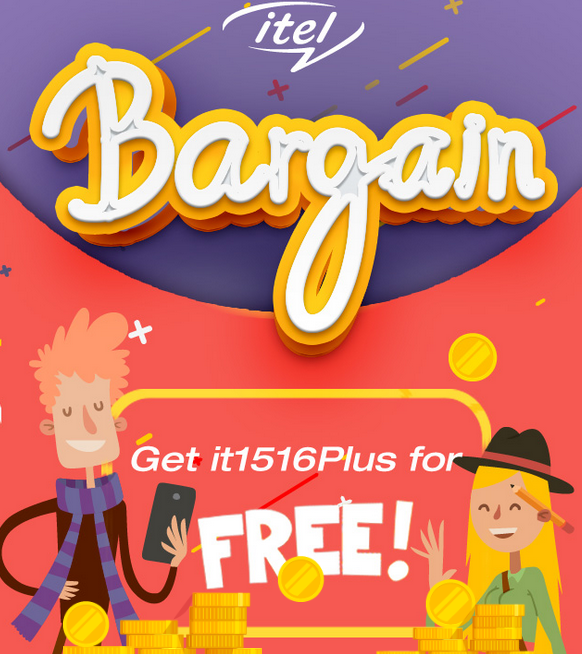 According to Itel, you need to Bargain before you can get this it1516 Plus for FREE. The offer/promo started yesterday which is Oc1.1st and is ending by Oct.14th 2016. So, How can I participate for this offer? Is quite simple, see it below. First of all, Click HERE and it will redirect you to Itel website where you will be told to login your Facebook account and after you are logged in, Press the “Bargain now!” After that, press the “Bargain now” again then the price of the phone will be deduct randomly. You will get the award according to your final performance. Participants who got a bargain price between 0.02-12100 NGN (half the price of it1516 Plus, which may vary in different countries) will get it1516 Plus at half price. When the activity is over, itel Mobile will release the list of winners and the involved shops on the Facebook page. itel Mobile reserves the right of final interpretation for this activity. Ladies and Gentlemen, you still have questions to ask about the process then drop them through the comments box.